GTO: Great Teacher Onizuka, a young thug who while in school was the leader of the most revered and feared gangs in all the city, now starts his career as a teacher GTO or Great Teacher Onizuka is the name Onizuka has given himself in order to motivate himself. GTO starts off with Onizuka checking out some of the high school girls and two guys try to swindle money out of them. Onizuka beats them up as he is a second degree black belt. The only thing on Onizuka�s mind is to score with as many high school girls as he can. Late for his first day on the job, he is overwhelmed by the girls in short skirts and their beauty. Onizuka is starting as a student teacher not a certified teacher yet but a first step to becoming a real teacher. Onizuka being a former thug himself is allocated the most troublesome class in the school and by the looks of it they�re all in the same gang themselves. Poor Onizuka finds himself at the mercy of the entire class as he is duped into taking home a female student that has ran away from home, when the young girl is making him tea she takes off her clothes all except for her underwear. Unfortunately this leads to them being in a compromising position that is taken advantage of by some of his thug students who come in and take a photo of him with her and use it to bribe him for one million yen. Excited by their coming money, the three guys that took the pictures brag to each other in the park about how great its going to be, when a motor bike appears and they tell the biker to shut up, not too long after the rest of the bike gang appears and threatens them, when Onizuka appears and begins to beat up the biker gang he teaches the three guys a lesson, when he arrives back at school the gang that were bribing him have cleaned up the entire school and do anything that Onizuka says. Onizuka is now in the good books with the principal but the girl that was in on the scam takes him home and introduces him to her real problems, but Onizuka being Onizuka he fixes the problem with his brawn, and now the girls parents start talking again and the girl promises to wait for him. When Onizuka finally finishes up, he moves onto the interviews to get a real job as a teacher, when he applies for a job at a school he has the worst possible interview ever, but when a group of outlaw drop out students appear and want to beat up the vice principal. Onizuka beats up the vice principal because of the mean things he says to the students, thus avoiding any confrontation with the students. Thinking he�s blown it he gets a job as a truck driver and then when he was told that if he can get to the interview he would have the job, he floors it to get back in time the principal is impressed by his determination and the way he handled the situation earlier. Onizuka gets the job and starts his illustrious career as GTO, Great Teacher Onizuka. The series has great potential, though he does get set up with the worst class in the school �again�. 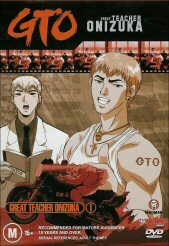 Onizuka�s character and the way he handles the students, and of course his uncontrollable temper will give birth to a new way of teaching; the GTO way. DVD has great quality picture and sound and with no sign of glitches. Extras aren�t too bad either with shorts of Onizuka�s uncontrollable urges and anger, some images of the creation of GTO, cool show.